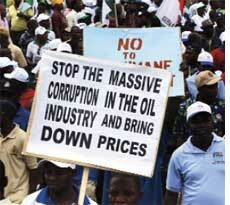 Thousands of workers in Nigeria protested in mid-May the proposed deregulation of the oil sector. The government in February said it would deregulate the downstream oil sector, which deals with refining of crude oil for domestic consumption. It is managed by the state-owned Nigerian National Petroleum Corporation. The government had also announced its intention to end subsidies saying it could no longer bear the 640 billion naira (US $4.34 billion) a year spent on subsidies. Nigeria, the world's eighth largest crude oil exporter, imports a substantial part of its petroleum needs because of the poor state of its four crude oil refineries. Nigeria Labor Congress, the country's main labour union that led the protest, said deregulating the sector could mean higher prices for petrol and petroleum products. Malaysia's apex court ruled that indigenous people in Sarawak, a state in the island of Borneo, have customary rights to the land they have used for hunting, gathering and growing food for generations. The government cannot take it from them without compensation. The state government had claimed the tribes have no legal rights to their ancestral land and leased to logging and palm oil companies. Survival International, a non-profit supporting indigenous people's rights, said the ruling would help Penans and other tribes in the region "who are desperately trying to stop these companies from razing their forests". The tribes have filed about 200 land rights cases. The ruling was in response to a lawsuit filed by a family in Sarawak whose land was taken over by the government in the 1990s for oil exploration. The family had asked for compensation. Venezuela's National Assembly hurriedly passed an amendment to the Hydrocarbons Law on May 7. Hours later President Hugo Chavez promulgated it. Later on the day, his government expropriated 39 oil service providers, many subsidiaries of foreign companies, saying the law now extends the state's control over all activities related to the industry. The oil services providers, who carry out essential tasks in oil fields such as drilling new wells, re-injection work and maintenance, were operating in the oil-rich Maracaibo lake in the western state of Zulia. Chavez who personally oversaw the state takeover said all 8,000 workers of the companies would be absorbed by the state oil corporation Petroleos de Venezuela. Chavez claimed the nationalization measure would save the country US $700 million. The law also gave local courts exclusive jurisdiction to settle disputes between the government and private companies, shielding the country from international arbitration. The move is seen as the latest step by the socialist president to tighten his grip on the petroleum industry. 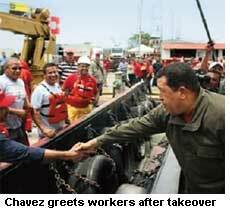 In 2007, Chavez's government turned over control of the oil-rich Orinoco Belt ousting foreign oil companies. Venezuela is the world's fifth largest oil exporter. The rush for the seabed reached a climax with the deadline on May 13 for coastal countries to claim extensions of their continental shelves beyond the territorial seas. Seen as the last big carve-up of maritime boundaries, the effort will also set limits for national rights to everything from oil and natural gas to life on or beneath the seabed. The UN Commission on the Limits of the Continent Shelf, set up in 1982, had asked all countries that ratified the Law of the Sea treaty before May 13, 1999, to claim beyond the territorial seas stretching 200 nautical miles (370 km) from the coast within 10 years. While submission claims have been trickling over the last few years, the commission said in 2009 alone it received submissions from 35 countries. The distant offshore seabed had long been seen as of little commercial interest. But recent studies that proved huge amounts of untapped natural resources beneath the seabed has resulted in increased commercial interest over the distant offshore seabed. While the submission of the claims has highlighted territorial disputes, the highly anticipated territorial confrontation--determining control of the Arctic Ocean's seabed--will not happen now. Russia has decided to postpone its Arctic bid to 2013 and said it can wait till Canada and Denmark work through their surveys. The US, though an Arctic neighbour, is yet to ratify the treaty. 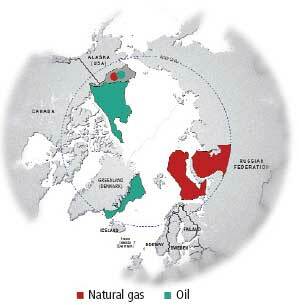 The Arctic Ocean is known to contain three-fourths of the world's untapped reserves of oil and natural gas. 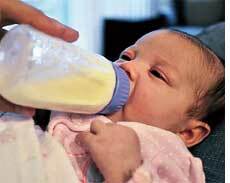 Chicago became the first US city to ban the import and sale of baby bottles that contain a potentially dangerous chemical, bisphenol A. 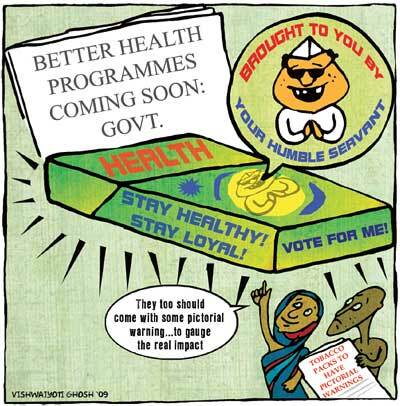 The city council said they pushed for the ban after the federal government failed to take action over the grave public health issue. The chemical bisphenol A, or bpa, is commonly used to harden plastics, among other uses. Studies have linked exposure to bpa --which can rapidly leach from plastic bottles when exposed to hot liquid--to damage in developing brains, early puberty as well as heightened risk of cancer later in life. Israel is illegally exploiting a conquered territory to serve its own economic needs, said the country's human rights group Yesh Din. It has filed a lawsuit against the government for stripping Palestinian West Bank quarries of rocks and gravel for the benefit of Israeli construction industry. Such action is prohibited under both Israeli and international law, said Yesh Din. Israel has a shortage of construction material such as sand, gravel and boulders. It also has stringent laws governing noise and dust pollution from quarries. This makes operating in the West Bank attractive for Israeli mining companies, as the Palestinian Authority is unable to enforce environmental laws on the Israel-controlled territory. The West Bank quarries, according to Yesh Din, provide Israel with a quarter, or 12 million tonnes, of its annual needs of construction material. Palestine's environmental authority said quarrying by Israel is causing damage to West Bank's ecological balance and affecting its flora and fauna. Pollution from quarries is also affecting the Palestinians, with increased cases of asthma in the mining area. The increase in incidence of suicide among young people by consuming poison in Benguet province of the Philippines has alarmed health officials. Seventeen youngsters, aged between 17 and 25, killed themselves in 2008 by consuming pesticides commonly stocked by farmer households. Their number was six between January and April this year. Governor Nestor Fongwan formed a task force to look into the cause of the suicides and determine if the widespread use of chemicals in the province's vegetable farms could be a reason. The profiling of the victims is yet to be completed. The Pest Management Council of the Philippines said social and cultural factors could have caused the suicides and that the use of pesticides was merely incidental. The Philippines is aggressively promoting pesticides to make agriculture globally competitive. 2008 saw a fundamental transition in the world's energy markets both the EU and the US added more renewable energy than conventional power, said a report by REN21, global renewable energy policy network based in Paris. Global power capacity from renewable energy sources reached 280,000 megawatts in 2008-a 16 per cent rise from 2007. Solar power capacity increased by 15 per cent, while wind power capacity grew by 29 per cent, said the report. Developing countries, particularly India and China, played a prominent role in manufacture and installation of renewable energy, with India emerging as a major producer of photovoltaics, while China doubled its wind power installation in 2008.